One of the greatest parts of exploring the Japanese gachapon industry is to see how much influence people’s love for capsule toys, vending machines and collectibles is influencing retail trends and distribution models. 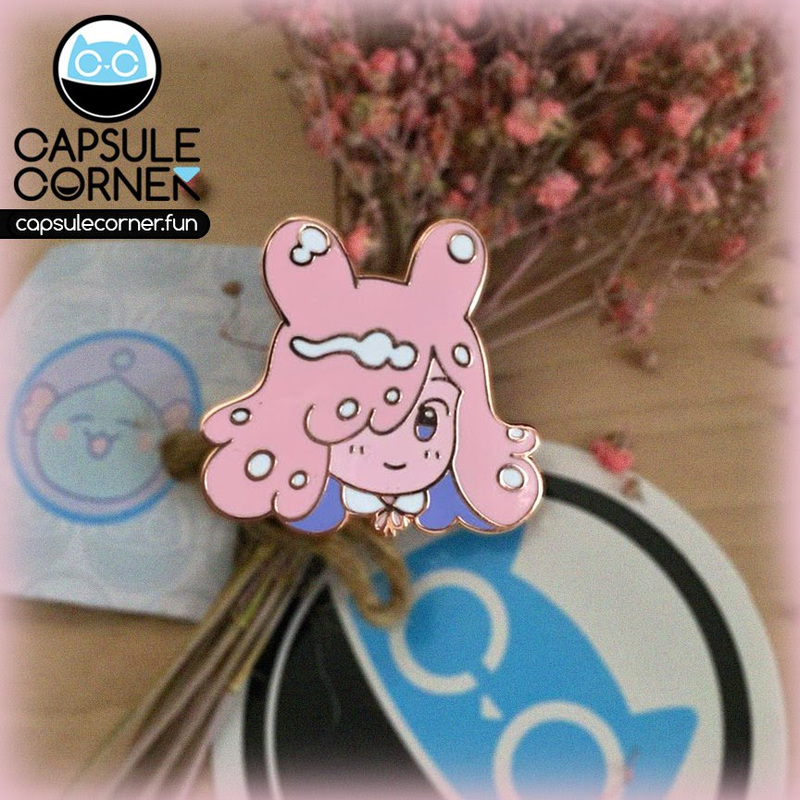 Edie Xu of LA’s CAPSULE◒CORNER micro gallery concept, is a brilliant entrepreneur who is using re-tooled gachapon machines to collaborate with “capsule artists” and to distribute unique collectible art. I was lucky enough to interview her and chat about her gallery CAPSULE◒CORNER and the inspiration behind her vendible art concept. Can you tell me a bit about yourself, how the Capsule Corner, “Micro Gallery” art exhibit came to be and what the aim is of this art project? I’m an artist myself who really wanted to create another opportunity for my fellow artists to be able to show and sell their personal work. The “micro gallery” method was an affordable way to setup a gallery space so that it didn’t have to rely as heavily on sales as other galleries might. This way it provides more freedom to explore different types of shows without the pressure of the bottom dollar being super present. There are so many amazing and talented artists out there right now that super deserve the attention and the opportunity to show in a gallery setting. For a lot of these artists there isn’t as much opportunity to show work unless it’s in group or themed show. These shows are designed to make sales by engaging in a particular interest or by garnering interest due to the number of artists participating. Which can be super fun to participate in but often times it doesn’t allow the artist to express something as personal as they might want. The “Micro Gallery” aspect also takes some pressure off as it’s not really a “full” show either. Usually a full solo show would consist of 10 to 15+ pieces but this type of scale can be just right for young artists now that juggle day jobs, conventions, and/or commissions at the same time. What inspired you to use gachapon machines and capsule prizes as a distribution model for your art exhibition? I wanted to use a Gachapon machine and capsule prizes because they’re fun. Art and art collecting should elicit those same feelings. A gallery doesn’t need to be something stuffy or quiet it should be something that really brings out joy, Gachapon is a very accessible medium that can be enjoyed by everyone. Deeper than that I wanted to explore the concept of collecting and value or worth by blurring the lines between art and commercialism. Concepts explored within the Super Flat movement by artists like Takashi Murakami or Nara. Value and worth are very arbitrary but also highly personal. A piece of art being valued at thousands of dollars or someones figure collection being worth a lot of money, is that more important than what that piece of art or collection is worth or means to the person themselves? The randomness of the Gachapon machine is similar to any economy around collecting really. Art is no different. A piece you buy now at $500 dollars could be worth 5 million a few decades from now. The machine really makes the user look at the items and say, “oh I want that specific one because…” and then what follows is a very honest and personal reason and I think reveals a lot about the way people might engage with media or art. What kind of feedback have you had from your artist collaborators? How have visitors respond to your unique exhibition approach and art distribution model? Everyone so far has had a really good time! As an artist myself I try really hard to be as artist friendly as I can with the gallery and overall wanted to make an experience or space that I wish would’ve existed when I was first entering the art scene here. There’s also been a lot of positive response from visitors as well although there are certain folk who do need some educating on the whole Gachapon concept. But part of the goal especially with the current location is to also educate visitors on Gachapon machines and it’s culture. How has small batch indie artist manufacturing IE enamel badges, vinyl stickers, resin toys, micro art, contributed to the development and perhaps liberation of artist made merchandise? Absolutely amazing. It’s been wonderful for artists to help them make a living. Small batch runs and the accessibility of manufacturing this merchandise has meant so many more opportunities and more amazing creations. It is now so cool to see so many cool things and not just from the artist’s perspective and the way they can make a living but as consumers you just have so many options now! For this project too since Capsule Corner handles the production costs of the prizes it also gives artists an opportunity to test out a medium of merchandise they haven’t yet worked with to see what their fan’s responses are to it and if they like it I never have an issue with sharing with them who my manufacturer was to help them do more in the future. How do you replicate the excitement of the physical interaction with a gacha machine with your mail-based subscriptions? One thing I’ve done is allowed for reveal videos. Gachapon videos were a big thing and maybe still is? Where people just take videos of them using a machine and showing what they got. You can really fall down a pretty deep hole of those on Youtube.. I wanted to get more into that subculture of Gachapon by making those for people who order online. So I’ll take a video of me using the machine and revealing what they got, then tag them via Instagram or Twitter. I’ve thought about a more robust checkout experience too. Currently there’s a thank you page that shows an animation of TOKENs being put into a machine and the wheel turning which I will be updating to 3D soon but I have explored the idea of the whole TOKEN process being almost a virtual Gachapon experience. It kind of asks the question is the excitement in the initial reveal or is the excitement still there if they have to wait longer? In what ways does a randomized reward system encourage customers to collect art? In many ways like a group art show might bring out a diverse audience who then discovers new work, having a set or “rotation” of prizes designed by a group of artists allows people to discover new artists they may not have known about before. All original art purchases through Capsule Corner also includes the artist’s designed prize so that system encourages and rewards buying original art. The two systems weigh against each other a bit to try and strike a balance. Which gachapon machine models do you currently use? I currently only have one machine and it is not an official Bandai Gachapon machine. I was worried at the time about using one of those as Gachapon or “Gashapon” is officially trademarked by Bandai so I didn’t want to base the entire operation on another companies trademark, just the concept. This machine is customized to fit the custom TOKENs for it as well. What’s next for Capsule Corner? There are some exciting artists I’ll be working with in the future and many who’ve expressed interest in it. I really want to keep testing the boundaries of what can be prizes though. The first quarter of 2019 will be a musician and then I also would really love to expand more into game territory as well. It’d be fun to push collecting beyond the material and into an expanded experience. Physically for the space the goal is to have more machines. Potentially having a row of the Capsule Station IV machines with a flat surface up top that would have maybe more of the prizes you’d find in the machines normally or artist merchandise that will be stocked as part of the CORNER Store. Pink Gorilla Games of Seattle, Washington keepin’ it green by collecting empty gachapon capsules. Collecting empty capsules is also a common practice in Japan. You will see these baskets on top or below gacha gacha machines. Industry leaders like Takara Tomy and Bandai Namco are working towards reducing waste by reusing or recycling capsules. The US gumball and bulk vending industry is still going strong and toy vending machines can still be found across the country in supermarkets, toy stores, gas stations and restaurants. This following photo was taken at a Toys R Us before it closed, and featured a variety of cheap trend based toys and candy ranging from 25 to 75 cents. As you can see the quality of toys found in US toy machines do not compare to gacha gacha toys in Japan, where they are priced between 100-500 yen. A big part of this is the “dollar coin problem”. The US is one of the few countries in the world that does not have a dollar coin (or equivalent) in wide circulation. This puts a price point restraint on the cost of materials, charchter license and design of the toys, which prevents the industry from evolving into a higher premium industry. Match this with the fact that Americans are holding on to less and less coins only deepens the problem. However, there is still room for a lot of innovation and growth in the US toy vending industry. For example, Arizona based SSM Vending have released a lot of great novelties for the US vending market in recent years, including teaming up with Marc Beaudette and Matt Doughty of Onell Design (of GLYOS fame) to distribute Bit Figs, a highly prized series of pixilated characters and other quality lines like Dinos & Fossils and PIX BRIX. As Americans increasingly move into a cashless society, it will be interesting to see how the US bulk vending machine industry develops. Will digital payment systems finally release vendors from these price point restrictions and allow them to sell premium toys? And will US toy and novelty companies return with even greater toy surprises? Tons of gachapon toys for sale at Kinokuniya, in Edgewater, NJ. Instead of selling gacha in gachapon vending machines they display them in clear buckets. It’s cool that you can pick out the exact toy you want but I missed that wonderfully crunchy gacha gacha crank sound!